OCD, obsessive-compulsive disorder, is anxiety characterized by unreasonable fears and thoughts that lead to compulsive behaviors, such as repeatedly checking whether you locked the front door or washing your hands. Although these rituals provide temporary relief, intense anxiety soon sets in, leading to a vicious cycle. With effective treatment, people with OCD can live full, successful lives, according to the National Institute of Mental Health. Dietary changes may support other treatment forms in managing symptoms. Whole grains contain all nutritious parts of the grain, providing more nutrients and with a milder impact on blood sugar than refined grains. As carbohydrate-rich foods, whole grains may help your body produce serotonin — a feel-good brain chemical that promotes calmness. The Association for Comprehensive NeuroTherapy, ACTN, recommends eating whole grains and limiting refined foods, such as white bread and sugar, and maintaining healthy blood sugar levels, for improved OCD symptoms. Nutritious examples include oats, barley, brown rice, wild rice, quinoa and popcorn. When purchasing breads, pasta and cereals, check nutrition labels to ensure that whole grains are listed as main ingredients. Low-fat dairy products, such as milk and yogurt, contain valuable amounts of protein, which promotes blood sugar balance and the amino acid tryptophan, which promotes calmness. Ideal bedtime snacks contain protein-rich foods and carbohydrates, according to the National Sleep Foundation, because carbohydrates make tryptophan more accessible in your brain. 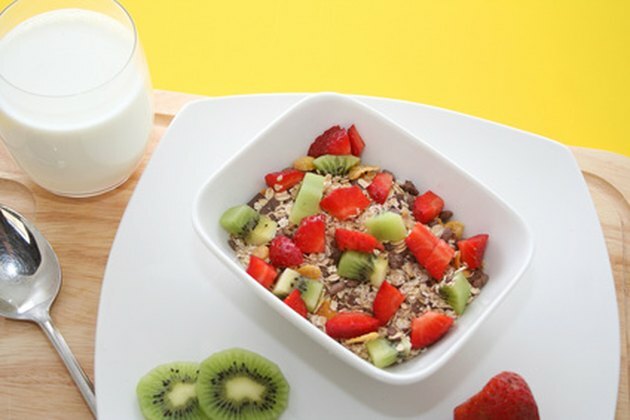 For reduced anxiety and sleep difficulties, consume balanced meals and snacks, such as whole grain cereal with low-fat milk or yogurt topped with granola. Fruits and vegetables are top sources of antioxidants, such as beta-carotene and vitamin C, which support your body's ability to resist infections and disease. For improved anxiety symptoms, MayoClinic.com psychiatrist Daniel K. Hall-Flavin recommends eating a diet rich in fruits and vegetables and avoiding overeating. Because fruits and vegetables are rich in water and fiber, they promote fullness between meals and may help guard against overeating. Particularly nutrient-rich varieties include berries, cherries, citrus fruits, tomatoes, leafy greens, broccoli, bell peppers, Brussels sprouts and squash. Fish, walnuts and flaxseed provide protein and a variety of helpful nutrients. Cold-water fish, such as salmon, herring, lake trout, halibut and mackerel, ground flaxseed and walnuts are prime sources of omega-3 fatty acids -- essential fats that play an important role in brain function. Although research is ongoing, according to the ACNT, omega-3 fats may provide exceptional benefits for people affected by nervous disorders. For best potential results, regularly incorporate cold-water fish into balanced, healthy meals. Walnuts and flaxseed provide nutritious snack foods and additions to smoothies, yogurt, cereals and baked goods. MayoClinic: Coping with Anxiety: Can Diet Make a Difference? How Can OCD Be Prevented by Diet?